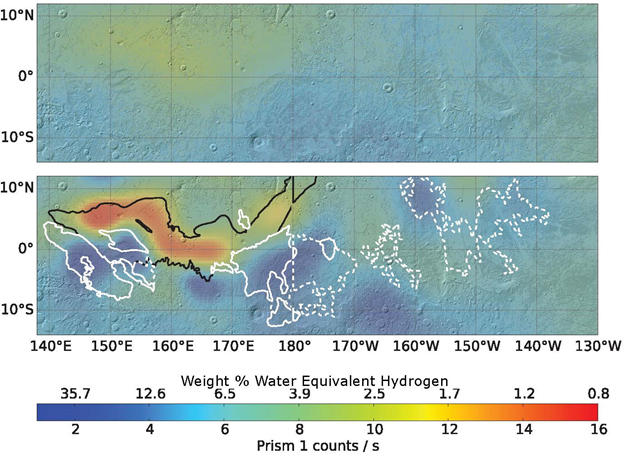 It’s long been known that Mars had large bodies of water some millions of years ago. Traces of these ancient Martian lakes and oceans have been found in recent years, thanks to information provided by probes and landers, like NASA’s Curiosity roverand the Odyssey spacecraft that currently orbits the red planet. Now, a team of astronomers from the Applied Physics Laboratory (APL) of Johns Hopkins Universityfound large deposits of what could be permafrost ice in the most unlikeliest of places on the Martian surface. The ice was discovered in an area on the Martian equator called the Medusae Fossae, which spans several hundred kilometers across. Scientists had assumed the equator would be too warm for ice to stay intact near the surface for so long. Permafrost ice has been spotted on Mars using data provided by the Odyssey spacecraft’s neutron spectrometer, particularly at the red planet’s polar regions, which was confirmed in 2008 by NASA’s Phoenix lander when it uncovered chunks of pure ice just a few centimeters below the surface. The specialized spectrometer picks up neutron radiation coming from the Martian surface when high-energy cosmic rays pour down from space. “These interact with the top meter of the soil and kick out particles, neutrons included,” Johns Hopkins’ APL planetary astronomer Jack Wilson told Cosmos. Analyzing those particles can identify what substances the cosmic rays are interacting with. Recently, Wilson and his colleagues gave the Odyssey data a second look, because the earlier studies had a very low resolution at just around 520 kilometers. They managed to reconstruct the image to a resolution of 290 kilometers. “[It’s] similar to lowering the altitude of the spacecraft by 50%,” Wilson said. “You’re getting a better view of what’s going on.” It was then that they saw high concentrations of water — about 40 percent of the region by weight. They published their findings in the journal Icarus. The surprising discovery is certainly very much welcome. Considering the many plans in the works to reach Mars—SpaceX with its redesigned BFR and Lockheed Martin with its Mars Base Camp, which could very much work in tandem with NASA—the presence of an abundant source of water on the red planet is a plus. For instance, Lockheed’s Martian orbital space station and its next-generation surface landers are designed to be refueled using water from Mars. In the same way, SpaceX’s new BFR has a similar design for creating rocket propellant using compounds from Mars. As Wilson notes, rocket fuel is “is in large part hydrogen and oxygen,” meaning the equatorial water could be vital for supplying these future missions. Then, there’s also the possibility that Martian underground waters carry some form of microbial extraterrestrial life, or remnants of life that once was. The abundance of water on Earth is one of life’s clearer signposts, and astronomers are hopeful that the presence of water on Mars — and elsewhere — can offer the same.